The ever increasing demand for electricity and the need to reduce the share of fossil fuels in power generation have led to rapid development and growth of the renewable energy sector and notably photovoltaic (PV). PV technology challenges the conventional approach to energy sources and power systems (e.g. fossil fuel powered generators, transmission lines and grid extensions). The PV sector is also an industry sector where R&D still plays an important role as it is a hybrid of the semiconductor and energy-related industries. Development of new technologies within the PV sector is continuing in the search for greater efficiencies and lower cost. The direct current electricity produced by solar cells can power equipment and recharge batteries. From the space industry sector that first used them to power satellites and spacecraft, they have become mainstream, and are used for grid-connected power generation and increasingly for off-grid applications where they have proven to be extremely cost-effective. International development funding agencies are increasingly incorporating PV systems into their aid projects for many applications including lighting, water pumping, vaccine cold chain facilities, communications and rural electrification. IEC Technical Committee (TC) 82: Solar photovoltaic energy systems, was established in 1981 to prepare International Standards for systems of photovoltaic conversion of solar energy into electrical energy and for all the elements in the entire photovoltaic energy system. In this context, the concept "photovoltaic energy system" includes the entire field from light input to a solar cell to and including the interface with the electrical system(s) to which energy is supplied. 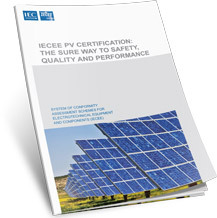 More information on TC 82 scope and standardization activities, its liaison with other IEC TCs and organizations outside the IEC, as well as on the PV market can be found on the TC dashboard and in its Strategic Business Plan.